Getting to the top in life and sitting among top influential men is never an easy task, especially when one has to start up as a bottom feeder. Such a task was what Andrew Carnegie went up again. He is a well known Scottish-American industrialist and philanthropist who is a perfect testimony of how hard work can lead a person who was not born into a life of privilege to achieving their dreams. Andrew Carnegie worked so hard that he beat the expectations life stacked against him and today he is known to be one of the richest men the world has ever seen. Andrew Carnegie was born to William Carnegie and Margaret Morrison Carnegie, on November 25, 1835, in Dunfermline, Fife, Scotland. He was raised along with his younger brother, Thomas Carnegie. His father William was a local hand weaver, who managed to make ends meet. Andrew attended the Free School in Dunfermline, which was donated to the town by the philanthropist Adam Rolland. Things began to fall apart for his family when the Weaver Machine was invented, it led to William losing his job and being unable to provide for his family. His mother, Margaret then became the breadwinner of the house as she started selling potted foods to support the family. Margaret’s income wasn’t enough as the country itself went into starvation. To enable them to relocate the family to the United States of America, Andrew’s parents sold off their properties. Andrew was 13 when his family eventually immigrated to Allegheny, Pennsylvania. Despite relocating, life was not better for the Carnegie family; William’s weaving business still did not flourish and Andrew had to join his father in job hunting. Eventually, they both got employed to the Anchor Cotton Mill, owned by a fellow Scottish man. Andrew’s job at the cotton mill was as a bobbin boy, where he worked for 12 hours a day, 6 days a week and earned $1.2 a week. A year later, Andrew began earning $2.5 a week, working in an Ohio-based Telegraph Company as a telegraph messenger boy. His hard work soon got him promoted to a telegraph operator. Even though he couldn’t attend a regular school, Andrew Carnegie received an uplifting in his education when Colonel James Anderson had his personal library of 400 books opened to young working boys every Saturday night. Andrew became a regular reader and he borrowed books from the library regularly as well. He felt indebted to Colonel James Anderson for the opportunity he rendered to him and other working boys to help develop their intellectual and reading abilities. He then made a vow to himself that young boys who were not privileged to go to school will receive similar opportunities that Colonel James Anderson gave to him should he become wealthy. Andrew started working at Pennsylvania Railroad Company when he was 18, as a secretary/telegraph operator, receiving $4 per week. When he was 24, he was offered the job of the superintendent of the Western Division of the Pennsylvania Railroad, earning $1,500 per annum. He then hired his younger brother, Thomas as his personal secretary and telegraph operator. After several years of working in the railroad company, he parted ways with the company in good terms and went into the steel business where he made the majority of the fortune he was known to have. He founded his Carnegie Steel Company in 1892 and managed it with some of his other companies. When he was close to retiring, he sold his Carnegie Steel Company to J.P. Morgan for $303, 450,000 and his share from the sale amounted to $225.64million, which is about $6.8billion in today’s dollar value. The sale made him surpass John Rockefeller as the richest man in America for a couple of years. 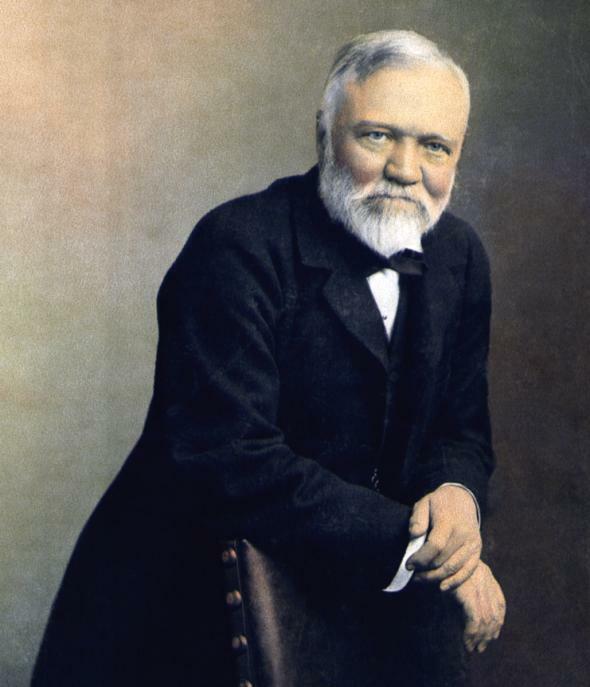 Andrew Carnegie died of bronchial pneumonia on August 11, 1919, in Lenox, Massachusetts, United States. Andrew Carnegie is known to be one of the richest men of all times. As of 2014, his net worth was calculated to be $372 billion, making him richer than all the richest men alive today. Andrew was named after his legal grandfather. His first job was as a bobbin boy, working at Anchor Cotton Mill. He is the founder of Carnegie Mellon University. He established the Carnegie Steel Company which is today known as U.S. Steel Corporation. He and his family moved to the United States when he was 13, in 1848. His first earning was $1.2 per week. He married Louis Whitfield in 1887. He had a daughter named Margaret Carnegie Miller, named after his mother. His final resting place is at Sleeping Hollow Cemetery in Sleeping Hollow, New York.